So after Slayton had gotten Dane to go on one adventure with him, he decides that his extended cast isn’t big enough and calls Dane back and tell him to bring a friend for his next mission. This new mission is to two fold. 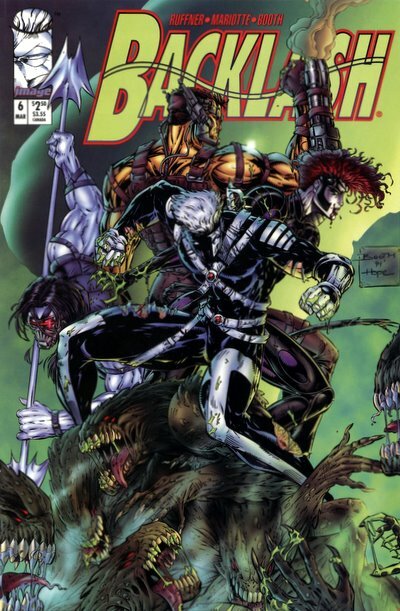 Part the first, Cyberjack and Taboo go and kidnap Dianne LaSalle from a bunch of StormWatch ground crew scrubs. Part the second, Slayton, Dane and Grail go to the lair of the Daemonite Lord S’ryn and nab him from right in front of Pike and pals. Why do all this now? Well, good question. I mean, in the end, we see him calling in his favor with Jacob and the rest of the WildC.A.T.s and since they have Voodoo, a better understanding of Daemonites, and crazy sci-fi equipment they can get LaSalle back into her right mind. But do we know all this going in? How does it get set up? Ugh, I’m going to have to go reread this again aren’t I? Ok, just did, and nope, no elucidation. When Slayton shows up at the Halo building, via Void’s transport, he says to Jacob that he’s “calling in his favor” which doesn’t make much sense, as he must’ve called in that favor earlier because Jack and Taboo are already there with LaSalle and Void is the one who got him there, this was all set up already. Either Slayton is kind of dense or he’s super socially awkward. Pris is able to extract the mind of LaSalle from the Daemonite, but is having trouble extracting the Daemonite from the body of the man it was possessing. S’ryn isn’t going down with out a fight. S’ryn pops out of the dude’s body, but as we’ve seen, that’ll probably leave the host brain dead. S’ryn is looking for a new host, but that’s not the best plan as there isn’t a lot of options for him in a room full of Kherubims and such. Taboo pops him one and then Slayton goes all smoke-form and gets into S’ryn mouth then reconstitutes and tears S’ryn apart from the inside out. As he’s dying, S’ryn makes fun of Slayton for not knowing himself. S’ryn is taunting Slayton’s Kherubimness with his final breath. This is confusing to Slayton as he doesn’t even understand the term. Jacob explains it to him, as he’s saying “welcome to the family!” This doesn’t last too long as LaSalle is back and she wants to spend some time with Slayton after all he’s done. The next issue is split into three stories. The first of which concerns Slayton trying to connect back with LaSalle. It isn’t going so well. She’s having trouble coming to terms with all the people that he’s killed along the way to save her. Also, she’s not too keen on him hooking up with Taboo. Slayton goes for a walk to clear his head. When he’s out Taboo calls, saying that there’s some sketchy folks following her, and that message goes straight to the answering machine. Which LaSalle hears. After that call she phones StormWatch asking to be put back on active duty and where to go to catch the next shuttle to SkyWatch. In Taboo’s story, we see her making the call that broke up Slayton and LaSalle, and we meet the crew that’s been following her. We saw a bit of these guys a few issues earlier, but they were yet to make their move. Now, without Slayton and Jack around, it is time to strike and capture that scofflaw Taboo. For all her powers, Taboo is really crap when she’s in a fight alone. You could say “but it’s 4 against one, the odds aren’t in her favor!” and I’d counter that saying that when she’s part of a group of as little as her and Slayton, she can take out at least 20 goons. You can’t tell me Slayton is carrying her the whole fight! Besides, these jokers are going at her one at a time anyway! But yeah, in the end, she done got captured. Our final story introduces a new character. An Aussie dog-man named Dingo. Yes, yes, Dingo is a Kindred, but a member of the Kindred that was brought to Australia from Cabillito Island at a young age. We see his past as a young dog-boy who is adopted by an Australian military man and raised to be a respectful member of society, as apposed to being raised as the weapon he was brought to the country for. After the passing of his adopted father, he goes out into the world to see what it is like. Of course he ends up running into and working for Bloodmoon and other members of the Kindred. As soon as we saw his “such-a-good-puppy” face, we knew this was going to be a Kindred thing? Right? Was it just me? After Slayton takes off with S’ryn, Pike mentions to Hestia, the Cabal’s pet Coda, that this is the second Daemonite Lord they’ve lost in their service. This is what you get for selling out your people Pike! At one point S’ryn calls himself a High Lord of the Daemonites. Is that because he took Hellspont’s place in the Cabal? We know that both Hellspont and Defile are High Lords, and then there’s the dead one that had his hand sticking out of the ground, but that’s it, right? Isn’t there only three High Daemonite Lords that came to Earth, and each one holds a key? And isn’t that why Hightower is trying to get a key? To up his level? Without actually having Hellspont’s key why does S’ryn think he’s automatically granted High Lord status? Good thing Slayton visited the WildC.A.T.s when he did with Cole out on assignment in DC. I’d hate to have to sit through another few panels of them being bitter towards each other. I’m not entirely sure that issue 7 was originally drawn to be issue 7. Excepting a few exposition panels, you can swap it with issue 8 and be kinda fine. 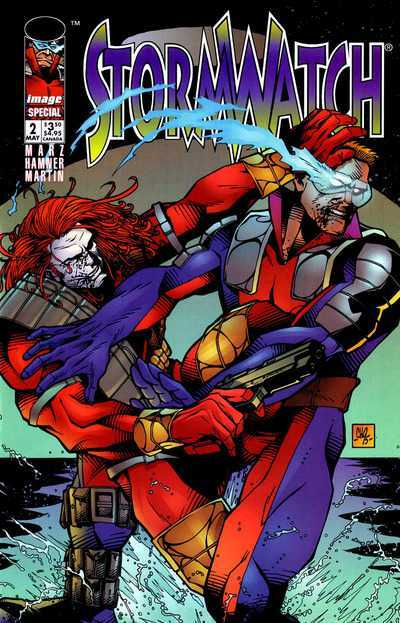 Maybe there was some reason why the “WildStorm Rising” crossover had to be issue number 8. My main reason for thinking of there is something up, is that Slayton says that it had been 2 weeks since the WildC.A.T.s helped with LaSalle in issue 7. There may be something do this, as according to comicbookdb.com issues 4 and 5 each had a cover date of February, meaning they may’ve gotten ahead, thus the slight wrinkle in continuity. Was there a last minute rewrite on the first page of issues 8 and 9 to address this? Who knows. More at odds is the fact that in issue 8 Slayton says he stepped out on LeSalle to help Taboo… but we saw him leave in a huff not knowing about Taboo’s trouble, LeSalle doing what she could to get out of there and rejoin StormWatch and then the message being left on the machine by Taboo. Did Slayton come back, not see LeSalle, heard the message, and bolted, figuring she’d be back soon, not knowing that LeSalle had already taken off? Again, who knows. I’m probably overthinking this one! Slayton has spent a handful of issues of “StormWatch” volume 1, four issues of “the Kindred” volume 1 and six issues of his own series trying to save his lady, and LaSalle just ditches him? Because he killed? Really? What did she think he occasionally had to do in Team 7 or for StormWatch? Oh, I see LaSalle, it’s alright to kill for your government but not for love. To be honest, I’m of the mind that the WildC.A.T.s did take a little bit of time from the end of issue 18 to the start of issue 19 of “WildC.A.T.s” volume 1 to properly mount an attack on Hightower and the Coda in DC, (more of that in the next entry) but 2 weeks seems a bit long for them to wait. NEXT : “Grifter : One Shot” by Steven T. Seagle, Dan Norton, Chuck Gibson, Troy Hubbs and Edwin Rosel.